They say football (or soccer, if you are from the US) is the best sport in the world; I agree with that. It brings people's lives closer; the same thing happened to our beloved guitar master Ritchie Blackmore and his fiance Candice Night; they met on a soccer field almost 20 years ago. The result of this unfortunate football match came 10 years later on 1997. The couple of Ritchie and Candice formed BLACKMORE'S NIGHT. It was a black page written on the rock history but it was a dawn for medieval, renaissance, folk music in the 21st century. After BLACKMORE'S NIGHT released 6 studio albums in 10-years time with many golden albums awards, their unique music got through on a wider audience because of Blackmore's fame and fan base. 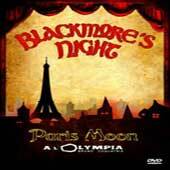 On September 20, 2006 BLACKMORE'S NIGHT visited France for the first time and their performance at Olympia Music Hall in Paris was filmed for the Paris Moon DVD. The first thing you notice on a BLACKMORE'S NIGHT live performance is the way the members of the band are dressed. It is something like between Halloween costumes and a medieval theater production. Ritchie Blackmore is dressed like a villager and Candice Night is like the queen of all the queens. This is the only thing that draws your attention even though the direction, lighting of the stage and the quality of the picture are really good. The band enters the stage with Past Times With Good Company followed by JETHRO TULL's Rainbow Blues, the first of the covers to come. Ritchie Blackmore changes form classical to acoustic guitar and mandolins, the renaissance music themes are extremely nice because of the perfect sound and smooth way the band is playing. Between the songs Candice changes to a number of instruments like woodwinds and tambourine and she talks to the crowd, which is really warm and helps to the whole recording-a-live-DVD process. The best moment is when she invites Ritchie Blackmore to speak on the microphone to his audience and he avoids to do so. Ritchie's guitar playing style has improved even more because his experience grows and the acoustic-classical guitars do not leave space for a mistake , the clarity of his sound creates fabulous music note progressions that gives him the freedom to transform and bend any popular melody. For example. Soldier Of Fortune's infamous intro gives its place to Blackmore's improvisations to set the musical carpet for Candice to introduce the Blackmore/Covardale masterpiece. I do not think that Candice Night should sing such an emotional song. The next cover song of this live DVD suits her the most. Diamonds & Rust is lot closer to Joan Baez's original version and far away from JUDAS PRIEST's cover that we enjoy the most, from this incredible song. After a bass solo from Sir Robert, which is passing from DEEP PURPLE riffs to Mozart's melodies, and the classical keyboard solo of Bard David, I though I could hear the Blackmore electric sound again. The legendary Fender Stratocatser is in the hands of its master again, unfortunately for only two songs, Ariel and Loreley. I wish it could last a little longer because on the next song Ritchie is playing hurdy gurdy, a medieval folk instrument with strings, something that looks like a violin but instead of a bow it has a little wheel. I cannot describe my disappointment. The concert ends with the French enthusiastic crowd applauding and cheering for BLACKMORE'S NIGHT's music, the closing credits start to roll and Richie Blackmore with Candice Night walk in a green valley until they disappear from sight. In the DVD's documentary Blackmore explains that there is a lot of snobbery for BLACKMORE'S NIGHT's music because the rockers say it is to folk and the folk musicians say that is to hard. Candice also explains that the band is like a family and describes the way the musical mind of Ritchie Blackmore works, a machine that she named as Blackmorizing Machine. Paris Moon also includes a live CD with 9 songs from that particular concert and two bonus studio versions of The Village Lanterne and All Because Of You. Die-hard fans of BLACKMORE'S NIGHT and Ritchie Blackmore have already pre-ordered Paris Moon DVD/CD (which hits the stores at December 30th); I am sure of that. The rest of you that want to see the guitar master perform live, wait until a RAINBOW reunion or something; the monster is still asleep and Candice sings lullabies to his ear.